ORLANDO, FL (February 16, 2018) – The Laser Institute of America is pleased to announce that the 2018 Laser Additive Manufacturing (LAM®) conference will be held at the Schaumburg Convention Center in Schaumburg, IL, March 27–28. For the first time in its 10-year history, the conference will be co-located with the Lasers in Manufacturing Event® (LME®). LAM attendees will be granted free access to the LME exhibit, which takes place March 28–29. 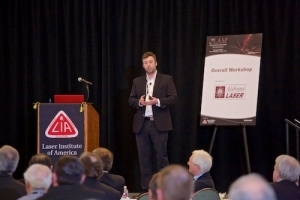 The LAM conference is an excellent networking and educational opportunity for anyone interested in working in the additive manufacturing industry or discovering laser additive manufacturing solutions for their company. Last year’s conference chairs will reprise their roles, with Milan Brandt of RMIT University continuing as the General Chair, and John Hunter of LPW Technology, Inc. and Minlin Zhong of Tsinghua University serving as Conference Co-chairs. The first keynote speaker, a representative from America Makes, will address the benefits of public-private partnerships in the additive manufacturing industry. On the second day, keynote presenter Ehsan Toyserkani of the University of Waterloo will discuss recent developments in additive manufacturing in Canada. The educational sessions following the keynote speeches will feature industry experts from companies including GE Additive, Flow Science, Caterpillar, the National Institute for Standards and Technology (NIST) and the Fraunhofer Institute for Laser Technology. The presentations will cover laser cladding and welding, laser metal deposition, powder bed fusion, directed energy deposition, process monitoring, quality assurance, sensor technologies, additive manufacturing standardization and strategies for growing the metal additive manufacturing industry. At the end of the LAM sessions, attendees will be invited to attend a reception on the LME show floor and to explore all of the laser manufacturing technology solutions LME exhibitors have to offer. LAM is made possible by sponsors Alabama Laser, TRUMPF, LPW and Laserline. Each company will have representatives available at both the LAM and LME events to answer any questions attendees may have. For more information and to register, visit www.lia.org/lam.